Cardiac cystic lymphangioma is a very rare tumor of the heart. , Cardiac lymphangiomas most frequently occur in the pericardial space, sometimes compressing adjacent structures;  a chylous pericardial effusion may also be present. To the best of our knowledge, only nine cases have been reported in the medical literature  . We report a case of isolated pericardial lymphangioma in a 1-year-old child. A 1-year-old child was suffering from recurrent episodes of cough and expectoration, and had progressively worsening respiratory distress. His chest X-ray was normal, and a single-slice post-contrast computed tomographic (CT) examination revealed an anterior mediastinal cyst, which showed no enhancement on CT. An attempt at surgical removal at another centre had to be abandoned due to severe bleeding and the patient was referred to our centre for a complete diagnostic work up. A 64 slice multidetector CT (MDCT) angiography was performed using ECG gated acquisition. The acquired volumetric data were used to reconstruct multiplanar reformatted (MPR) images, maximal intensity projections (MIP), and volume rendering (VR) images [[Figure 1]a]. The study revealed a huge well-circumscribed lesion centered along the right atrioventricular groove. The right atrium was seen to be compressed and splayed along the posterior border of the lesion. The right ventricle was also splayed along the anterior border of this huge lesion. The lesion measured about 5 Χ 4.8 Χ 6 cm in its maximum transverse, anteroposterior, and craniocaudal diameters, respectively. It appeared hypodense with no contrast opacification within, yet with the residual enhancing wall. The right coronary artery (RCA) was seen splayed at its origin at the upper border of the lesion with some of its branches seen passing through the lesion [[Figure 1]b]. No definite extensions of this lesion into the right atrial or right ventricular cavities could be detected. Associated pericardial thickening and encysted right-sided pericardial effusion were also noted. High-field 3-T magnetic resonance imaging (MRI) was then performed in the axial and sagittal views using T1, T2 turbo spin echo (TSE), balanced turbo field echo (BTFE), and turbo field echo - diffusion weighted (TFE-DW) sequences. This confirmed the CT findings and the soft tissue mass elicited a heterogeneous hyperintense signal in T1 WI with an intense bright pattern on T2WI, showing internal intermediate heterogenous septae [[Figure 2]a]. It abutted the anterior aspect of the right ventricle and atrium; both were compressed with an indistinct plane of cleavage between the mass and cardiac muscle. The right coronary artery and its branches were seen traversing the lesion likely encased by this soft tissue, predominantly cystic, lesion [[Figure 2]b] and encysted pericardial effusion was seen [[Figure 2]c]. By means of these two advanced diagnostic modalities, we were able to reach a diagnosis of a multilocular cystic lesion mostly pericardial in location, intimately related to the right atrioventricular groove apparently inseparable from the cardiac muscle. The patient was then readmitted for surgery where the tumor was indeed identified as a multilocular cystic lesion that bled profusely, and also oozed lymphatic contents upon its incision; it was removed carefully with a safety margin, with careful extraction of the coronary artery and its branches. A small tumoral component was seen extending into the right atrial myocardial tissue, which could not be surgically excised. 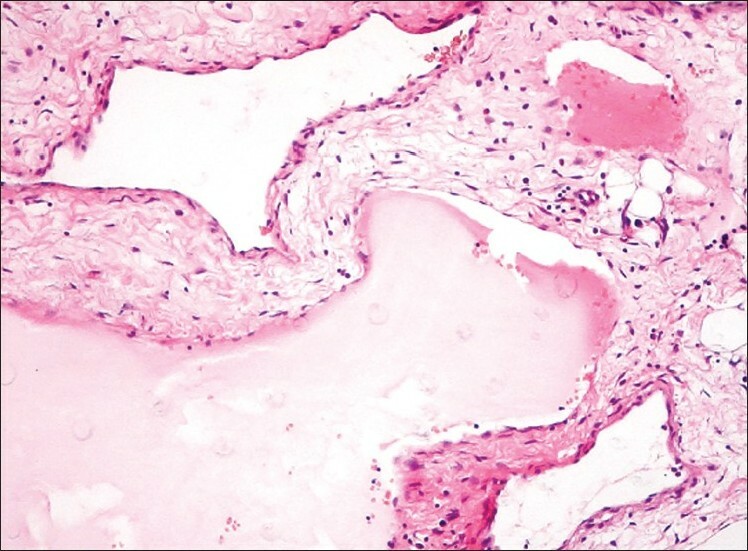 The tumor was then sent for histopathological evaluation revealing a cystic cardiac lymphangioma [Figure 3]. The postoperative course was uneventful. The patient is asymptomatic and without recurrence 5 months postoperatively. Cardiac lymphangiomas are very rare. Although first described in 1911 by Armstrong and Monkeberg, only a few cases are described in the literature  . The armed force registry of benign cardiac tumors in children only found 2 cases in 319 cases of benign tumors and cysts of pericardium,  and an European multicentric study of tumors in children did not find any cardiac lymphangiomas. Araoz et al.,  reviewed the pathology and imaging features of benign cardiac tumors including lymphangioma. Lymphangiomas are scarce congenital malformations of the lymphatic system which can be categorized into four groups: (a) lymphangioma simplex or circumscriptum; (b) cavernous lymphangioma; (c) cystic lymphangioma or cystic hygroma; and (d) diffuse lymphangiectasia. Cardiac lymphangioma are most often diagnosed incidentally by chest X-ray presenting as asymptomatic masses. However, they may cause congestive heart failure, syncopal or embolic pathology, arrhythmias, palpitations, or cardiac tamponade. , Majority of symptoms are accredited to their size and location. In our case, the size of the neoplasm may have caused compression of the anatomical structures adjacent to it causing symptoms of respiratory distress. Cystic lymphangioma is typically a multiloculated lesion with cystic cavities divided by the septa of variable thickness. MDCT and MRI were helpful in our case in determining the extent of the neoplasm, its cystic nature, and its relationship with the surrounding structures. CT features of mediastinal lymphangioma are as follows: a well-circumscribed lesion, showing no calcifications and with varied attenuation values within the lesion. MDCT was also diagnostic in the localization of the lesion as being extra-cardiac, and could determine precisely its relation to the RCA. At MRI, these tumors may have a high signal intensity on T1-weighted images,  perhaps due to the presence the proteinaceous material in the lymph within the stroma. The tumors also display areas of a high signal intensity on T2-weighted images due to cystic spaces. In this case, MRI could confirm the CT data that the lesion was intrapericardial, extra-cardiac in location, and was inseparable from the cardiac wall. Cardiac lymphangiomas have a possible risk of recurrence, especially if there has been incomplete resection. , Therefore, extensive resection is recommended. In our case, the lesion was extra-cardiac, infiltrating the right ventricular wall, with a small intracardiac component, yet it was totally resected during surgery with the reconstruction of the wall. In conclusion, imaging with MDCT and MRI aid in the proper diagnosis of pericardial lymphangioma. A meticulous planning is required for surgical excision of this lesion. We report this case because of its rarity and to highlight the role of imaging and the surgical challenge in view of its vascular element and proximity to coronary vessels. 1. Naz I, Lone I. Cystic lymphangioma of heart. Internet J Pathol 2009. Available from: http://www.ispub.com/journal/the_internet_journal_of_pathology/volume_10_number_1_12/article/cystic-lymphangioma-of-heart.html. [Last accessed on 2010 Feb 21]. 2. Daubeney PE, Ogilvie BC, Moore IE, Webber SA. Intrapericardial lymphangioma presenting as neonatal cardiac tamponade. Pediatr Cardiol 1996;17:129-31. 3. Araoz PA, Mulvagh SL, Tazelaar HD, Julsrud PR, Breen JF. CT and MR Imaging of benign primary cardiac neoplasms with echocardiographic correlation. Radiographics 2000;20:1303-19. 4. Engberding R, Daniel WG, Erbel R, Kasper W, Lestuzzi C, Curtius JM, et al. Diagnosis of heart tumours by transoesophageal echocardiography: a multicentre study in 154 patients. European Cooperative Study Group. Eur Heart J 1993;14:1223-8. 5. Hilliard RI, McKendry JB, Phillips MJ. Congenital abnormalities of the lymphatic system: A new clinical classification. Pediatrics 1990;86:988-94. 6. Paþaoðlu I, Doðan R, Ozme S, Kale G, Bozer AY. Cardiac lymphangioma. Am Heart J 1991;121:1821-4. 7. Jougon J, Laborde MN, Parrens M, MacBride T. Cystic lymphangioma of the heart mimicking a mediastinal tumor. Eur J Cardiothorac Surg 2002;22:476-8. 8. Riquet M, Briere J, Le Pimpec-Barthes F, Bely N, Dujon A, Velly JF, et al. Cystic lymphangioma of the neck and mediastinum: Are there acquired forms?. Rev Mal Respir 1999;16:71-9. Khobta, N. and Tomasini, P. and Trousse, D. and Maldonado, F. and Chanez, P. and Astoul, P.
Biskupski, A., Waligórski, S., Mokrzycki, K., (...), Domagała, W., Brykczyński, M.